Cocopa Portable ultra-thin External CD DVD drive. Support Mac, PC, Ultrabook and Netbook etc. We use the latest version of the SATA interface DVD RW movement. With the advantages of high quality, high compatibility, high performance, strong stability, high speed, our external cd dvd drive wins customers' approval. Meanwihile, it has embedded unique burn prevention control chip, which can effectively prevent breaking the disk and gets super read disk error correction function while burning. This item can help to back up your data and enjoy the high-fidelity sound quality DVD and CD which is burnt from our external cd dvd drive. It can read CD, DVD, VCD and other formats disks. 4. Cocopa external CD Drive supports to read CD,VCD,SVCD,CD-R,CD-RW,DVD-R/DVD-RW and write CD-RW,CD+RW,DVD-RW,DVD+RW etc. 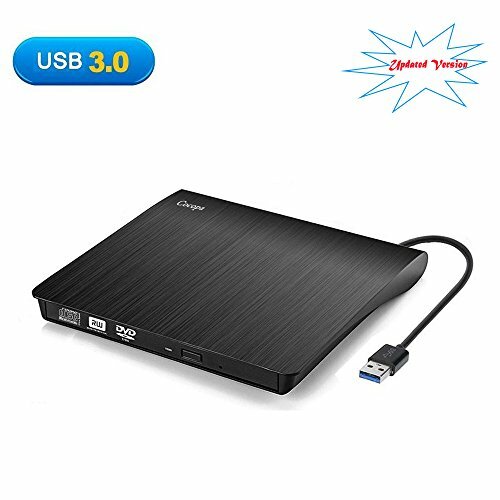 【Advanced USB3.0 Technology】Cocopa CD/DVD Drive is equipped with USB 3.0 high speed interface, bringing you faster data transmission speed (up to a maximum of 5Gbps) and stable performance with strong fault tolerance. It is backwards compatible with USB 2.0 and USB 1.0. USB3.0 transmission standard,backward compatible with USB2.0, data transmission speed stability, up to a maximum of 5Gbps. 【High Speed】Adopted unique intelligent burning technology, this CD-RW drive supported DVD+R, DVD-R, CD-ROM, DVD-ROM, CD-R, CD-RW. Max DVD read speed 8X; Max CD read speed 24X and max CD burn speed 8X. This external dvd drive equipped with brand new chip with strong error-correction ability, plays music and movies with no lag or distortion. It is compatible with USB2.0 and backwards compatible with USB1.0, efficiency more stable, applies more widely. 【Support Compatible Systems】This DVD drive is ideal for various devices. It support Windows XP/2003/Vista/7/8.1/10, Linux, all version Mac OS system. For the desktops, please connect the device to the USB port of the motherboard for normal use. If you have any questions about this product by Cocopa, contact us by completing and submitting the form below. If you are looking for a specif part number, please include it with your message.